So you want to make shadow puppets. Great! We have put printables online in our resource library (get the password here). You are welcome to print them on cardstock paper and put the parts together. To cast the best shadows, however, it is best to trace the parts on black poster board paper. This has the right thickness and and will cast the best shadows. Of course, you can also decide to design the puppets yourself! Then the printables could just serve as an inspiration and guide for proportions. 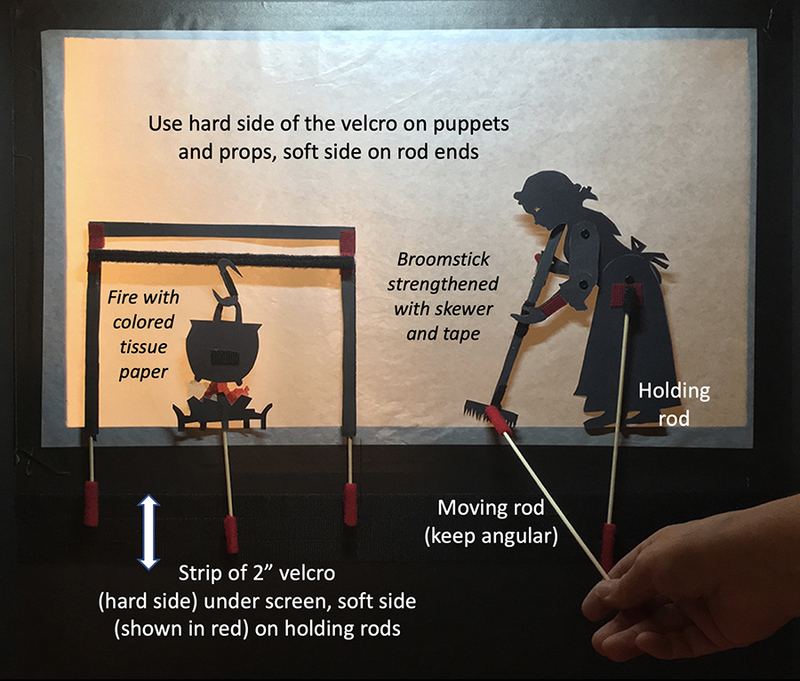 The size of the puppets in our printable library are for “desktop” shadow puppetry, in which grownup puppets are about 10″ tall. If you want to make puppets that are bigger, for instance for a larger audience in a school, you can enlarge the puppets on a photocopy machine to 150%. Puppets this size with moving limbs may need to be held by two children, particularly when the weather is humid, which makes the paper more floppy. Body part that move (such as an arm or a leg) are cut out separately, because they overlap with the body. Make a little hole where the body and the arm or leg connect (Use a 1/16″ hole puncher or the pointed end of your scissors). Attach the parts with a small paper fastener or paper craft brad. For rods to hold and move the puppet you can use barbecue sticks or bendable straws, or a combination of both. The most flexible rods are made of barbecue skewers and velcro, putting the hard part of the velcro on the body parts that need to move and the soft velcro on both sides of the skewer. 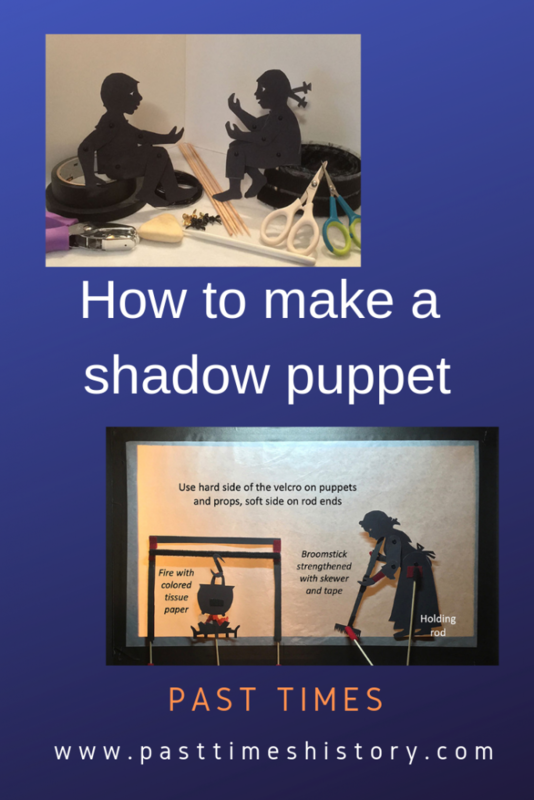 To make a sharp shadow your puppets need to be as close to the screen as possible. For desk top size puppets this means that the rods should be attached at the backs of the puppets at an angle, unless you attach the holding rod to the velcro strip underneath the screen. For performances with larger puppets and screens you will have a light behind you. In order not to cast your own shadow on the screen you will need to stay below the screen and hold the puppets up.